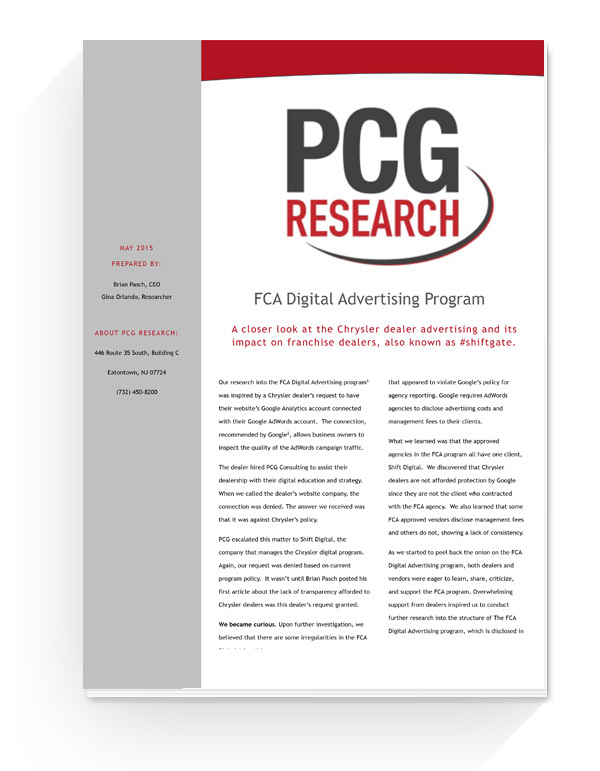 The FCA Digital Advertising program impacts the business operations of Chrysler dealers in the United States. The structure of the program, which is the focus of our research, must be changed to deliver on the promises made to franchise dealers to support their needs and desire to be successful with online marketing. We acknowledge the good intentions of Chrysler to get their entire franchise network engaged in digital advertising, especially since some dealers are not engaged online at all. However, the execution on how to attract, fund, and manage “digitally resistant” dealers is the focus of our research. The program falsely claims that dealers in the program are paying less than market rates for management fees; some dealers are paying over 300% of market rates. The program denies Chrysler dealers knowledge of their AdWords management fees, which is a long standing right that dealers have enjoyed under Google’s client/agency partner agreement. Chrysler dealers fail to see much value of the middle management role, currently handled by Shift Digital. Chrysler dealers are given monthly advertising reports that make it impossible to calculate their Return on Investment (ROI). Chrysler dealers have barriers in place that makes it difficult for them to inspect the quality of traffic generated by their FCA Digital Advertising investment. The program puts Chrysler at a competitive disadvantage against other OEMs and could hinder Chrysler’s market share growth. Posted on May 13, 2015, in Automotive Social. Bookmark the permalink. Leave a comment.